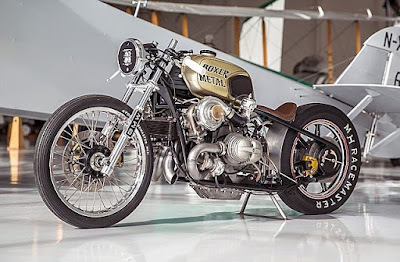 In the motorcycle world so many people who build and modify it, a wide variety of styles such modifications cafe racer, trackers, bobber, scrambler and a variety of other styles. 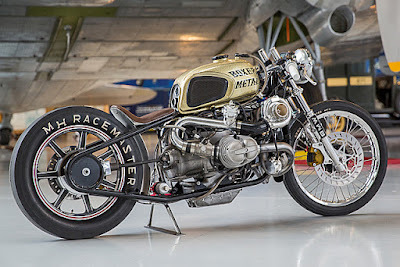 Similarly, with Chris Canterbury, the founder and owner of Californian-based motorcycle workshop named Boxer Metal, who had made a lot of people are amazed and astonished when they saw the figure of his fantastic and unique motorcycle which took the base of a 1980 BMW R100 and equipped with Twin Turbo. Initially, Chris made a few sketches and also creating a new rigid frame design for a BMW motorcycle, which was inspired by the people who add a turbo on a BMW boxer motorcycle, then Chris should be able also to do it, because Chris himself craved a motorcycle with a turbo for 15 years, and now Chris has a chance to realize his dream motorcycle. 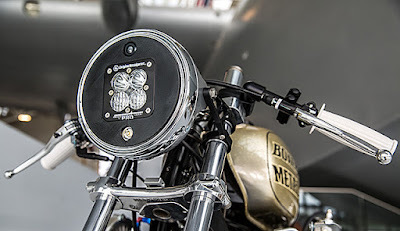 What needs to be done by Chris is guaranteeing the motorbike functional and pleasing to the eye. 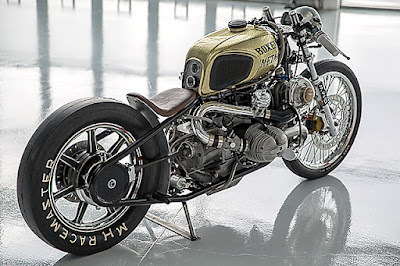 When made a few sketches, Chris assisted by a friend who worked at BMW Motorad, for the donor is taken from the motorcycle also be selected each components to be used, if necessary replaced or made by yourself, to its bare frame also constructed carefully. 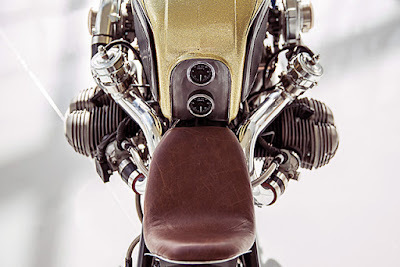 Chris is also convinced that the frame which has designed by him can be to sustain when the turbo engine will be installed, so everything is amplified by using a larger diameter steel materials. The frame is finished with powder coating and assisted by his friends from the Hot Coats garage. Motorcycle seat is also designed with a very neat and comfortable, and then to the seat pan and fenders made in-house by his own at Boxer Metal, a sitting position is designed such that its gravity center can help the speed of motorcycles. To make it different from other motorcycle, Chris uses Dnepr gas tank, painted and decorated by Dennis Price, with the color shades of various themes that looks like a Harley. With the dominant color of gold flake candy plus the accents and pinstrip are aligned and look more glamorous. Tank lid using custom cap with the colors of alloy Toaster Tan. 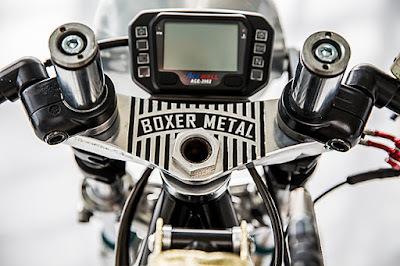 While the old-spring is replaced with with a set of progressive forks and brakes using the 320 mm brake of special custom-made by Boxer Metal yourself. Added also clip-on bars are aligned with the master cylinder grip control. The latter is rear wheel vintage models lester mag modified to fit with the custom braking system.